List all public properties and makes it easier to visit them. Create a tour group that makes the Be My Guest achievement easier to obtain. After downloading, extract to the WildStar Addon directory (default is %appdata%\NCSOFT\WildStar\Addons). If necessary rename the extracted folder to HousingTour. Adds right click options Tour Home on other players and Go Home for you. Search for public property with /ht <PlayerName> (see below for full list of slash commands). The List brings up a list of properties you can visit. Only shows MEGASERVER style names for now. Public properties are denoted with a "p", neighbors a "n", and you will be "y". Important Notice: This mod can automatically port you without notice only if (1) you are in player housing, only if (2) you are opted in (check box), and only if (3) you have typed in a Tour Guide's name. Once you meet those requirements the Tour Guide can port you without further warning. In case it's not intuitive; to join a tour click the Join a Tour check box (it's a round box). You must set a tour guide with the "Change Guide" button. This is not case sensitive. To lead a tour, click Join a Tour and set yourself as the tour guide. So, you suckered some people! I mean... got a group to tour houses (probably seeking the Be My Guest achievement). As a Tour Guide the right click menu option will change to Send Tour Here. This will take you, and everyone in housing with you as their guide, to that player's home provided it is public. Tour Guides can also use the new Public List window. After you set yourself as a guide, player names clicked on in Public List will take the tour there. Silent Mode keeps the main form opening when visiting a property from slash command. It still opens with /ht. Output to Chat puts the message seen in the main form in the debug chat channel. Search Intensity is the number of searches for public properties when no more unique properties are found. Higher numbers means longer search. The default of 1000 usually works just fine, but crank it up if you think it's not finding someone. 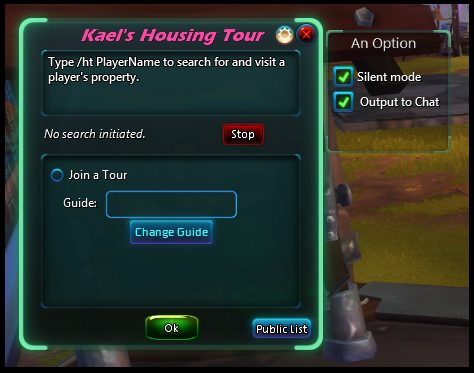 The options are saved account wide at %appdata%\NCSOFT\WildStar\AddonSaveData\<wildstar account>\Kael's Housing Tour_0_Acct.xml. The following commands are available for anyone to use. /HousingTour or /ht Opens main form. /HousingTour <PlayerName> Port you to PlayerName's public property. /ht <PlayerName> Shorter version of previous command. /ht ~ Takes you home. /ht al or /ht pl Opens Available List. These commands are only for the tour guide. /HousingTourGuide <PlayerName> Will take the tour the named player's house if it's public. /htg <PlayerName> Keyboard stroke saving alternative to previous command. /htg ~ Sends all players to their respective houses. This addon is licensed under the MIT License (MIT) using Copyright (c) 2014 James Pryor and K. L. Phan, see LICENSE.txt included with this addon, or read this summary. Please send feedback to james@geekwagon.net. 2014-07-25 | v2 Free hugs with every purchase. Searching for public property will now auto stop after 1000 searches if no more unique properties are found. Added an options panel with two whole options! Option: Silent Mode allows you to visit properties from the command line without the main form popping up all the time. Option: Output to Chat, in case silent mode is too quiet. Public list... just go play with it. It's awesome. 2014-08-06 | v3 Oh my, look at all this work we have left to do. Option: Search Intensity is the number of searches for public properties done when no more unique properties are found. New slash command to go strait to Public List, /ht pl. Added "working" indicator to Public List. Added /home as an alternative to /ht ~. In the future it will take you home even if not in housing (by way of Recall - House), but it doesn't appear to possible with the current api. Change right click menu so it only shows up while in a housing zone, and only on players. Public List now shows any property you have access to (like non-public neighbors and yourself). 2014-10-18 | v4 Limited time offer on hugs. Modified to work on MEGASERVER! Available list currently shows new style player names (but you can still go to old names with slash command). Changed Public List to Available List because it shows all properties you can visit (public properties, neighbors, and yourself). Slash command /ht al opens it but /ht pl still works. History button shows the properties you've visited with KHT in a table. It's not pretty, but has time and date. Join Tour guide setting is slightly more intuitive.